Clay Douglas: Alright, good morning ladies and gentlemen, welcome to another edition of The Free American Hour. Im your host Clay Douglas and my guest today is Alison Weir of If Americans Only Knew [sic] Hello Alison, how are you? Alison Weir: Im fine, and thanks, how are you? CD: Tell me about them. CD: Well, yeah. Pleasant, pleasant guy there. AW: Yeah. He said, This is not a joke. On Monday you better watch out. Don’t come to work, and close your organization or you’re going to die. AW: Let me just comment on those threats. First of all, I’m not a communist. Its interesting that they go to conservatives, uh, Americans, and claim that I’m a communist. They go to liberal Americans, and claim that I’m a Right-wing associate of the Klan. So they make opposite claims about me, both of which are false, to whatever they think will sound the most negative to that audience. CD: You know, they call me a hatemonger. I said, I beg to differ. I think Angela and her kind are the hatemongers, and many Jews agree with me. Uh, Dr. Henry Makow, listen to Benjamin Freedman, watch Aaron Russo on my website. And I tell people, I said [unclear] my son, understand that these charges of being anti-Semitic, a racist or anti-government are lies generated by the ADL, SPLC and CIA to cover their anti-American activities from exposure, by crippling true threat and, you know, a true threat and danger to their plan for global communistic One World Government. The one you’ll live in if people like you and I are successively silenced. CD: I would like to believe that. I have a hard time understanding why they are not sending our law enforcement, and people like the CIA aren’t a little bit more astute at targeting these people or at least investigating them. AW: Well, they actually have often tried to investigate them. If you go to our website IfAmericansKnew, we’ve carried some excellent articles by people like Grant Smith of IRMEP, and books by people like Senator Fulbright from a number of years ago, his efforts to [unclear] on this, where they found that our Justice Department through the years actually did try to go after Israeli agents because they would, you know, they consistently violate US laws. So there were efforts to investigate them for spying, for leaking classified documents to other countries, to Israel and to China, and at some previous years during the Cold War to the Soviet Union. This is well documented. Our intelligence agencies and our Justice Department did try to investigate these activities, and what would happen is you know, this is amazing, you know, I was shocked to learn this, but they were canceled by people within the government who are loyal to Israel, and by people within the government who realized this is career-damaging to go after Israel and therefore they would prevent it from happening. So if you go back and read the public record, there have been efforts to investigate these. Just recently, there have been efforts to investigate the Israeli spies, just within the last year or two. You know, anybody that’s questioning what I’m saying, and I even to myself, I know this sounds extreme but, you know, I just encourage people to investigate these things for ourselves. Its important that we all ask these questions and look into these things, and you find these very disturbing facts. They’re [unclear]. They’re very available. Because of the internet, we can go to the documents where its being documented, and its very possible to learn the facts, but you do have to search for them. You have to ask the questions. You cant wait for the mainstream press either the liberal press or the conservative press to cover them. Portions of both of those media do cover them at times. So you have to search it out. You just have to ask the questions and do your own research, and then you can discover what is going on. CD: You know, I pointed out numerous times on my website and my radio show, that if somebody is a dual citizen, I mean, we how can they even hold a position of authority or influence? I mean, they’ve got especially in our Homeland Security and our FBI or our CIA, I mean, if they have dual citizenship, then that means that their loyalties are divided. AW: It does. I think its very unwise. I think its very unwise to let somebody with dual citizenship to have a major role. Its not to say, you know, there be somebody that’s a dual citizen, perhaps their primary loyalty is to the United States, I’m not saying it automatically is not, but we don’t know. AW: I think its appropriate for anybody that’s going to have a significant role in the US government, and in all sorts of different departments, that they should be required to decide which is their primary loyalty, and to discard their other loyalty. I just think this is a wise course of action for any nation to take. And Id like to disclose that I have a two-year-old grandson who will I expect grow up with dual citizenship with the United States and with France. My wonderful son-in-law is a French citizen. My, you know, little tiny grandson, will have the opportunity to have citizenship with both countries. You know, he will grow up mostly in the US, and, right now in fact, exclusively in the United States. So its not that I’m against people who have backgrounds or one parent that’s a citizenship of another country. I’m delighted that that’s the case with my own country. I think it will be a fascinating heritage for my grandson to have. AW: Nevertheless, when someone steps into a role of power in the United States government, it should be clear where their loyalties lie. I that’s a wise important course of action for any nation to take, and I think that’s a course of action that our nation should take. AW: But certainly that’s been debated. Our citizenry should discuss this, and we should decide as a nation what we want. But instead these things are being done behind closed doors, and most Americans don’t even know they’re going on. …and I think of Benjamin Freedman talking about the Zionists and how they organized the war. They declared war against the Germans, and they got the French fighting the Germans, the Germans fighting the Russians, and then threw Americans in the mix, so they had all of us Christians fighting each other, and now they are pushing us to fight another large religious population, the Muslims, and you know they tried to equate that with the… They used the Palestinians to do that, and they play the Muslims against us, don’t they? AW: It is a horrifying situation. For any listeners who are skeptical of what appear to be, quote, conspiracy theorists, this may sound unlikely; perhaps you haven’t heard this kind of discussion before and, by the way I’m somebody who’s very skeptical of information until I check it out for myself. I think most of us should be more skeptical than we are not just of, quote, conspiracy theorists, but of mainstream reports as well. I don’t think that we should automatically believe the mainstream press, and I don’t think we should automatically believe alternative theories either. I think we should look into them. But I completely agree with you: I think Benjamin Freedman’s speech and other writings that I have come across are extremely interesting. I know very little about this man I’ve started to try to research more about him to learn more about him but everything that I research about him is extremely interesting. I think his writings seem legitimate, they seem quite important, and they tell things that my other research is validating. For example, you know, I was I remember studying US history. I just got back from going to my high school reunion, and its made me think about high school quite a bit, and, first of all, I had this very good US history teacher in high school, but there are a number of things of course in US history that you’re not taught, partly because, you know, you can only teach so much in a one year course. But I think other things went on in terms of what things were filtered out of the curriculum. And certainly I had never been aware, until I started to study Israel/Palestine for myself, the significant role that Zionists played in pushing the US into World War One. Now, I don’t know I haven’t done enough research to know for sure, whether the Zionist role in pushing us into World War One was decisive or whether it was just one factor among many, but I do know that I never before was aware that it was even was a factor, and there is no doubt that it was a factor of some significance, so why don’t we know this? Why don’t we know that the Zionists themselves bragged about it, that Lloyd George, the leader, the British leader, later said “They made us promises and they kept those promises,” you know why don’t we know that fact? Its an important fact to know, that was a tragic war, in which Americans and others, mainly British and Europeans, lost lives, lost limbs, lost their minds in some cases, over a pointless, needless war. I think it’s very important that Americans know all the factors that led us to enter that war, so that we avoid these pointless, needless, tragic wars in the future. Especially now, when we’ve just been pushed into a war with Iraq, that is pointless and tragic. And that there are these same groups trying to push us into a war with Iran, which would also be pointless and tragic. We need to know these facts and we are not getting them very often. Were only rarely getting them from the mainstream media. CD: And the mainstream media is the Jews even brag about controlling the mainstream media, controlling Hollywood. They brag about it. This isn’t me saying the Jews do it, this isn’t a conspiracy theory, this is people that are heads of studios, Klein, people like… reporters… Jewish reporters are saying, Yeah, we control Hollywood. We control the media. We own ABC. We own Walt Disney. We own them. And that’s why the Palestinians are always pointed out to be bad guys. But let me ask you this. Now, your concentration and your focus has been on the treatment of the Palestinians. Isn’t that pretty accurate? That’s where you got your start right? AW: That’s right, the Israeli/Palestinian issue, which of course to a degree includes Lebanese as well, since they’ve been slaughtered twice by Israeli forces. But, yes, its mainly the Israeli/Palestinian issue is what I have focused on, what I started to learn about nine years ago. So that’s my major focus. AW: Let me just correct you. Don’t say The Jews. It may sound to people that you are saying every Jewish-American did this, which, as you’ve just said is not true. CD: No its not true. But Ive been considering just calling them Morlocks, hows that? CD: Morlocks. Its the Morlocks that are behind this all. Don’t make that a bad word like McCarthyism. But they have used the Jews the same way that they’ve used the Judeo-Christians across America. They’ve fed you false information, they’ve given you the Scofield Bible with all the notes in it, they focused your thinking. They don’t call it television programming for nothing. The point I’m trying to make here is that the Rothschild family that grew up in Germany turned on Germany. AW: Actually, they could immigrate to the US to a degree. What happened is that, when there was the rise of the Nazis, there was targeting of a number of populations within Germany, the Jewish population especially. So there were groups around the country that were trying to help provide places of refuge for people that were being targeted, including of course and especially Jewish-Germans who were being targeted, and Jews throughout Europe. So there were efforts to create refuges in the United States and elsewhere, under FDR, again this is well documented. The people who actively worked to sabotage those efforts were the Zionist leadership, that were so fanatically devoted to creating the Jewish state in Palestine that they wanted there to no place else that would be safe for Jews. So since there would have been, since there were people trying to… were creating many safe places for them, they were sabotaging those efforts so that they could claim to the world, Listen, we have to create a Jewish state in Palestine so that there’s a safe place for Jewish men, women, and children to live. And most of the worlds people are decent people and they do want to help children of every type, and people of need of every type, so this was part of the strategy that the Zionists were using before and during World War Two. CD: Isn’t whats happening right now in the United States I think this is totally related to whats going on in Israel, to the issues with the Palestinians. The Palestinians have all been turned into terrorists, and they’re trying to say at Homeland Security, which is controlled by dual citizens Morlocks, if you will that the American patriots, people like you and I, the Tea Parties, even the Oath Keepers, are being demonized sort of like the Jews were in Germany. They tried to call them communists, didn’t they? They said these are all communists. And they were. I mean Marx and Lenin were Jewish, so communism certainly has a role in there. And that’s been another word that you cant use in America. If you call somebody a communist, there’s an insinuation that communists are doing something against the United States. Well then, you’re a McCarthyism [sic]. AW: Well, there’s so much that… Labels that are… The problem with labels of course is often that they mean different things to different people. So “communist” to some people means an ideology that sounded benign, that sounded in some ways like Christianity. Jesus preached that we should do unto others as we would like them to do unto us, that we should share our worldly goods with others, with those in need, etcetera. Lets think what Jesus did teach us, how we should treat our fellow human beings. So to some people, communist means a very benign philosophy where you’re helping other people, you’re sharing your worldly goods, etcetera. That’s what it means to some people. To other people, it means what Stalin implemented and Lenin before him and what we saw under Mao, which was extreme cruelty, despotism in which people have no freedom, in which worldly goods certainly were not shared even close to it. Party leaders had a very disproportionate amount of them and the rest of the people didn’t. There were purges in which people were killed; people that dissented were sent, in the case of the Soviet Union, to Siberia to gulags that were horrific institutions. So again, if you say communist, to two people, if you had one of those little balloons over their heads like in cartoons, you would have very different images to different people, and that’s the problem. If you say “Zionist” to you and to me, we know that represents a thematic political ideology. Other people, it would be a question mark, What does that even mean? Some people would think, Oh that means a synonym for all Jews, which is incorrect. So again, labels its usually better I don’t like to use labels anymore because so often people either don’t know what it means or they think it means something different than the use you’re using for it. And that’s whats gone on here. I think it is, as you’re emphasizing, its very important for people to look into the background of these different movements, of these different events that have happened to previous decades, including World War Two, including World War One. Its very important that we look into these things. AW: Divide us against… Divide decent people against one another. I think that decent people can have different approaches to life. We draw from different information, etcetera. I think if more of us had the chance to meet and just talk to each other, and decide what course we want our nation to take, we would find much more common ground. But instead of having the opportunity to do that, you know, we are seeing each other through the media. And the media consistently emphasize the differences. They consistently report things in an adversarial fashion. You know, it’s the “Well, here’s one side,” and they give the view of that side… It’s often false. CD: That’s the reason, Alison, that’s the reason I started the Free American in the first place… I watched what the television reported happened at Waco. Now they murdered 17 little children to save them from a child molester?! And the media, the media covered it that way. I was outraged about it, and I started the Free American and I started the militias around the country. And nothing’s changed. They are still trying to demonize us. And that was a Christian church that they went after. You mentioned that… We’re talking about the Palestinians here. The Palestinians aren’t Arabs; there’s a lot of them that are Christians, too, aren’t they? AW: Well, Arab is just like saying Europeans, it doesn’t denote a religion. So yes, many Arabs are Christians, many Arabs are Muslims, some Arabs are Jews. You know, these are all different these are all religions and/or cultures, and Arab is a culture and a region, it’s not a religion. So, yes, as we know, Christianity began in Palestine, so many Palestinians are Christians. And plus the Apostles of course went throughout the region, so there are Christian communities throughout the region. Many Arabs that I meet are Christians. Their ancestors were Christians before many of our ancestors were Christians. I have talked to Arabs who have told me family stories about having their ancient ancestors being converted to Christianity by the Apostles. I talked to one Christian from Nazareth. Her family had handed down stories of being, becoming Christians hearing the words of Jesus of Nazareth. So again, this is very important, and many Americans are being mislead on this and don’t know this is the case. AW: Because so often the Israeli-centric media don’t tell it. You know, this is being left out of the news reports. It should be a part of them. CD: Now, this would seem to mean to me that maybe this is even broader than the issue with the Palestinians. Because of what’s happening here in the United States, because of the way patriots are being demonized, and let me just play a quick clip here from somebody that’s in the same position, pretty much, as you and I, as far as being demonized by the media. And this is in line with what I’m talking about there’s a war on Christianity. CD: Now that’s from the Jewish Times, 1999, that’s not anybody calling anybody names or lumping anybody in a group. This is what their news media is telling us. AW: So the voice was reading something that was in the Jewish Times in 1999? AW: Whose voice was that? CD: Another man that’s been demonized the same way McCarthy was, the same way that I’ve been“You’re, you’re anti-Semitic”the same way you have. AW: Do you I’m interested in that selection. Do you have the specific date of which issue of the Jewish Times that was? CD: Yes ma’am, October 29, 1999. And that clip, that film clip, is up there on my web site, right under the banner and above the radio show. On my website. AW: Okay, that’s… I will look up that reference, that’s pretty strong, so I’ll look that up. I do know, I know that now when I focus on, you know, when I am trying to get the latest news on Israel/Palestine, I largely find that the places that report on it the most, and therefore I try to read as often as I have time for, is the Palestinian press, which is quite good; the Israeli press, that tells a great deal and often has excellent journalists as well; and the Jewish press, it’s very important to read, whenever I have the time to read that press as well, The Forward, JTA, Ynet, you know, different Jewish newspapers around the country, are very important and very valuable to read. And most of us who are not Jewish don’t read them, naturally. But I’ve started to read those in recent years, and find them often a good source of facts that I would not otherwise have known. So I will look at the October 29, 1999 issue of Jewish Times. Hopefully I can find that on its own website or on hard copy or something in some library. I’ll look up that reference. It seems like an important one. CD: Yes ma’am. What is happening in American today, with the demonization of the Tea Parties and all that, you know… And David Duke’s pointed out about the menorahs being up. You can put it on the White House lawn but we can’t have a Christmas tree on the White House lawn anymore? AW: I don’t know is that true? I can’t… You know, sometimes we all hear things and we pass them on, and sometimes the things that we hear and pass on are true, and sometimes it turns out to be one of these urban myths that many of us have believed and told others and then it turns out somebody looks into it and it’s not true. So I personally don’t know for sure if it is the case, that a menorah can be on the White House lawn, but a Christmas tree cannot. That’s something I want to look into and find out if it is true. If it is true, certainly that would be very troubling and hypocritical, and make no sense to me. So I think that is something that I will also investigate and find out if that’s the case, because that would be bizarre. You know, the truth of the matter is that the majority of Americans as I understand it, I have looked at some of this before I don’t have the specific statistics, which shows that I need to look into it again, but its my assumption that a large majority of Americans do come from Christian backgrounds, both Protestant and Catholic and Greek Orthodox, etcetera. You know, the vast majority of Americans, it’s my assumption, are Christians of one sort or another, certainly from Christian backgrounds. So certainly I believe that the majority population should be represented. You know, if I moved to a country that was largely Muslim or largely Jewish, I wouldn’t feel, “Well, my..,” I should suddenly take over and change that country, I would have to fit in and play a role. I think minorities should be respected, I think all people should be respected, but I do think the majority of a population of a country should be paid attention to. That’s democracy in an election the majority wins the vote. So I would find it bizarre if a population that is somewhere around two and three per cent of our population can do things that the majority population cannot do. To be that would be a bizarre situation, and its something we should look into. AW: Well the thing about Solzhenitsyn that’s interesting is that he was a Nobel Prize winner, you know, very, very significant literary figure. He was… I remember when I was in high school back in the 1960s, and before, we were often assigned his books. There was one book in particular that I think probably many of us were assigned to read. So he was considered a major writer, and is a major literary figure. And yet, his later books, in which he does get into the topics that you just described, were not translated into English. They are in other languages, they are probably significant books to read, but most of us cannot read them because we don’t read Russian or perhaps French I think they may have been translated I don’t know what language they are available in but I certainly don’t read Russian. So I’ve been able to read excerpts from them, and articles about them, largely in the Jewish press which is where I’ve read about them. You know, of significant information about what he covered in those books, and yet most Americans don’t even know that these books exist by this major figure, because they’ve been so little discussed in the American media, and because none of our publishing companies have published them in this country. You know, what’s going on here? Why don’t we know about Solzhenitsyn’s important books? Why is he after having been considered a major literary figure that we studied in high school why is he now being, I feel and this is a strong statement once again we are seeing a person of significance being slowly erased from history in the United States? This has been done before. It was done against an American journalist of wonderful credentials and talent and ability, Grace Halsell, she was slowly erased from history. It was done against another, a woman that the Britannica Encyclopedia [sic] called “One of the most important female journalists of the 20th Century,” Dorothy Thompson erased from history. I really urge your listeners to look into Dorothy Thompson, to look into Grace Halsell, to look into Solzhenitsyn. We need to stop this process from occurring. CD: How do we do that, Alison? If the media is controlled… I went through a campaign, a presidential campaign in the Republican Party. I was rubbing elbows with Pat Buchanan, Bob Dole, Alan Keyes; I was working with Charles Collins. And every time Charles got up to tell the Republican Party that we could bypass the Federal Reserve, wipe out a six trillion dollar debt, which has now doubled in ten years… Every cameraman on stage turned the cameras off and pointed the cameras at the ground. So how do we change anything by voting, if the media doesn’t tell us who’s running? AW: [Laughs] That’s a good question. Because the thing that’s going on here, as you and I know I more recently than you is that, I mean, people know this, but it takes a while to absorb the meaning. Everything that we think we know about many issues except for local issues perhaps comes from the media. Very few of us have traveled to the Middle East. I did that a few years ago and now have done that… Now my knowledge of that area comes from outside the mainstream media. But all of our knowledge many times about each other liberals learn about the Tea Party: from the media. Tea Partiers learn about the liberals: from the media. We all learn about the federal government to a large degree, from, quote, the media. And yet, as many of us understand, but have not maybe significantly absorbed, that means that it’s being filtered through an institution that I now feel is highly flawed, where important information is being filtered. We’re not getting the full story on many of these important issues. So what do we do about that? Well, what we do is what you and I are doing this morning. We create and we become involved in alternative media. We research it ourselves; we use the internet. We have… There are alternative radio stations that are on the airwaves not very many of them, but those exist there are public access stations in our communities. We can put programs on there; we need to do that. We need to learn about one another and contact one another directly. When we learn important facts, we need to share them with others. We need to be careful, that we investigate information for ourselves, that we do not pass on fraudulent information. But these are all things we can do, and many of us are doing them. I think it’s essential that we do this more and more. That more of us step up when we say, “They should do that.” That probably means we have to do it, because there aren’t enough of us that are doing this now, and more of us need to step up to the plate and start doing this as well. And that is happening, fortunately, more and more of us are learning about these things, we’re researching them, we’re meeting one another I’ve never met you in person, but now I’ve talked to you on these radio programs several times. I learn from it every time. When you tell me things that I had not known before, I then try and go look into them. So, these are big issues. You’re looking into wider issues than I am focusing on. So the issues that I focus on, it’s very possible to know your larger issues should be investigated as well. And more of us are doing that. I think more of us are learning that we each have important things that we’re discovering that we need to share with one another. CD: I agree with that. I agree with that and the information that you put out is very valuable. I mean, that’s why I have links to your website on mine. Now, are you married Alison? AW: No I’m not, I’m divorced. AW: That’s [unclear] sad to hear. AW: I just wanted to say that’s very sad to hear that. It’s a sad thing Fortunately, that did not happen to me. This was a divorce of many years ago and not connected to this, but I know… I expect and do know it takes a real toll on friendships and on relationships. It’s an intense subject to get into, and not everybody really can sustain that. I’m sorry, go ahead. CD: … protesting the war in Iraq and Afghanistan. My question was: why weren’t the Tea Parties over there protesting with them? Why were these two groups be divided at all? The war in Iraq, the war in Afghanistan… The war in Afghanistan is about wealth. They’ve also discovered not only does Afghanistan have opium poppies, they’ve also got gold and silver and all kinds of metals in those mountain ranges over there… billions of dollars worth of wealth that we will be taking away from the Afghan people. So why, if you’re conservative, you’ve got to be for a pointless war? AW: Yeah, I think there is a great deal of divide and conquer going on, and as you’re pointing out, often conservatives were labeled, quote, isolationists. You know, that was considered a very negative term. Another way of thinking about that, though, is anti-interventionism, which means you don’t go around this whole huge world, trying to tell other people what to do. We have a hard enough time doing what we need to do in our own country. Resources are limited, we’re seeing many people out of jobs, many businesses going under, we’re seeing our veterans not even being served, getting insufficient, in many cases, medical care. So there is a great deal of need here. The idea of not going around intervening everywhere else can and often is a very valid one. Those when it was being done by conservatives was called isolationism, and given a very negative spin to it. And yet, often, even… I’ve just been recently reading about the lead up to World War Two. There were actually many people that, especially because of the experience of World War One, were opposed to getting involved in another European war. [Unclear] were not only conservatives, actually it turns out many of them were, quote, liberals. FDR of course was very early to have the US enter that way, perhaps for very good reasons. But he was very eager for the US to enter World War Two, and he did a number of things to make that happen. However, if you look at the structure of the country before that, both many conservatives and many liberals were all against entering another European war. They saw the tragedy it had been for the soldiers that were involved, they saw that it had been a pointless war, and many people were opposed to that happening again. So again, it’s this divide and conquer. And when we talk about “the media,” again, there are individuals many individuals within the media there are journalists, writers, reporters, camera people, etcetera that are excellent people, trying to do a good job, many of them doing a good job. But if you look at the over all structure of the system that is going on, what’s coming out, there is… The sad reality is that, they’re not doing a good job. The media overall are not doing a good job, especially in their coverage of Israel/Palestine. That’s what I’ve studied, that’s what I focused on. That’s the reality. CD: You know, I’ve been to New York City many, many times, and I’ve walked down a neighborhood in Brooklyn, and there were Jewish shop owners, or Muslim shop owners, and there were Christian shop owners, and they all got along, they all got along just right, just, well anyway… I mean, they may not have gone to the same restaurants to eat, or didn’t drink in the same bars, but they were in the streets of New York together. Why couldn’t that be done in Israel? I simply can’t understand why that wouldn’t work, what is wrong with giving the Palestinians equal access to Jerusalem, to the facilities there, why put a fence around them? AW: Yeah, that’s right, why imprison them? And I think… that’s what’s important for many people to know who don’t know it, think what it’s like to be in a prison. To be in… basically, Gaza, it’s a huge prison. One and a half million men, women, and children in this prison. And the West Bank is also very much a prison. It’s more porous, it’s a little more possible to get from one prison to another, but basically they are small prisons in the West Bank as well. And yet as you’ve said, before Zionism, before political Zionism, Jews, Christians and Muslims lived in Palestine for centuries, without armed conflict, without conflict, all practicing their religions. Christians and Jews lived throughout Iraq, Lebanon, Jordan, Egypt, Morocco… They lived throughout what’s… Jewish, Christian and Muslim human beings all living, without wiping one another out So what we are seeing here is the result of a political, a very fanatic political ideology, that divided people against one another, that was a type of colonialism, and the violence that we’ve now seen for decades. CD: Give out your website again, Alison, and, listen, since you’re in California, you should get over here sometime to Tucson and, uh, let’s talk. Let’s talk some more. AW: The website is If Americans Knew, I hope people will go to our website and please, please tell other people about it. If Americans Knew dot org. If Americans Knew dot org. CD: Alright dear, thank you very much for being on my show. AW: Thanks very much, take care. CD: God bless, bye bye. Alison Weir, serving as President of the Council for the National Interest, has invoked the anti-Semitic theme of Jewish power having long-reach “tentacles” in a recent announcement circulated on behalf of the CNI. 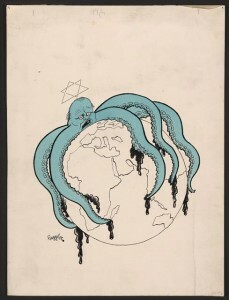 An alleged Jewish world conspiracy, pictured as an octopus spreading its tentacles, is a classic feature of anti-Semitic propaganda, seen for example in this Nazi cartoon circa 1938. 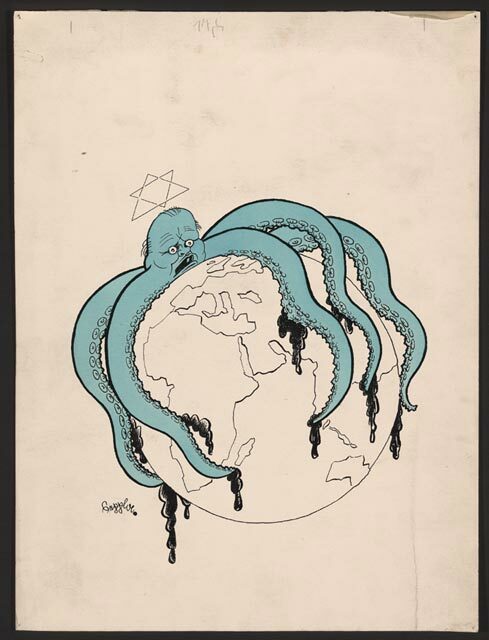 Other language used by Weir in her March 11 announcement further adds to the impression of a vast and monstrous conspiracythose in J Street are stated to “wrap themselves” in a “cloak,” and participate in “behind-the-scenes maneuverings.” Such language and imagery resonates with those who have already adopted the narrative of a vastly powerful Jewish conspiracy; it also spreads anti-Semitic themes to a broader public.